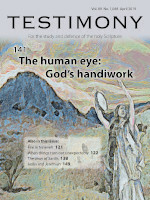 Full access to digital copies of the Testimony magazine one year in arrears. Full content of magazines are available online one year in arrears. The content listing of the latest print issue can be viewed online. We're interested in finding out how you usually read about Bible study, news and reviews so we can better tailor our services. Please spend a few minutes completing our survey. Published by the Testimony, our books cover a range of subjects that may be of interest to the Bible student. These can be purchased and shipped worldwide. Bible Inserts. Concise basic Bible principles. First Testimony article. Step back in time with Islip Collyer. Need more? All issues 1931-2014 on a USB drive. The USB pen drive can be ordered from the online shop. Nearly 100 years of Christadelphian digital content at your fingertips. Physical back copies are also available on request.